This entry was posted in General News, Students and tagged auburn abroad, honor on September 19, 2012 by Wire Eagle. AUBURN UNIVERSITY – Many Auburn students travel abroad as part of their educational experience, but 16 pre-freshmen ventured overseas for college credit before stepping onto campus this fall. 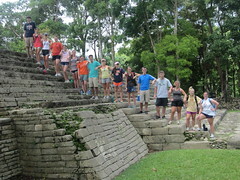 The students, now freshmen, in July traveled to the Central American country of Belize as part of Auburn’s new international studies course for high school honor students who have applied for admission to the university. This entry was posted in Campus Announcement, Community and tagged Community, honor, service on May 23, 2011 by Wire Eagle. AUBURN – Auburn University was recently named to the 2010 President’s Higher Education Community Service Honor Roll with distinction, a recognition of the nation’s leading colleges and universities for their dedication to civic engagement, service-learning and volunteering. The honor, which is administered by the Corporation for National and Community Service in collaboration with the Department of Education, Department of Housing and Urban Development, Campus Compact, and the American Council on Education, began in 2006.